It has been another wonderful season for us! We’re so grateful for everything that has gone on this summer. Lots of new things are happening for us, but we wanted to take a second to look back and appreciate all the wonderful things that this season gave us. Without the building blocks of history we’d never get anywhere, and we find it inspiring to see how much we’ve grown. The last 6 months has seen us enter a lot of new territory. We’re progressively expanding out from the festival circuit into more diverse markets. Our domes have always reminded us of soccer balls, so this year we decided to pursue the soccer market. So far our domes have been a huge success when set up on the soccer field, and we hope to see our domes on a lot more fields as we start touring tournament season in the Southern States this winter. 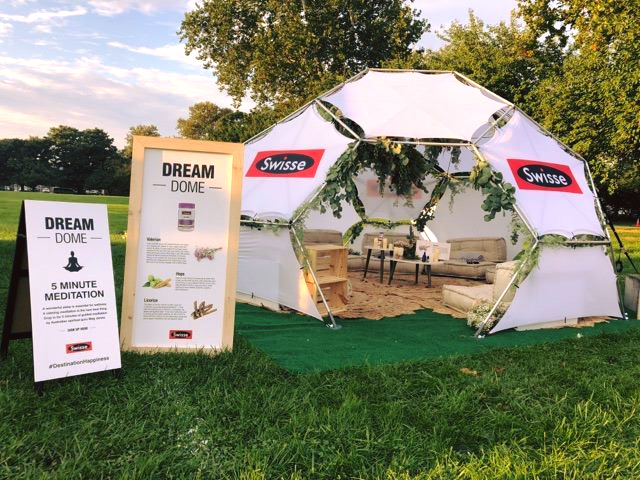 Our most exciting new partnership in the marketing sector has been with Mirrorball for the Swisse Dream Dome installation that toured this summer. 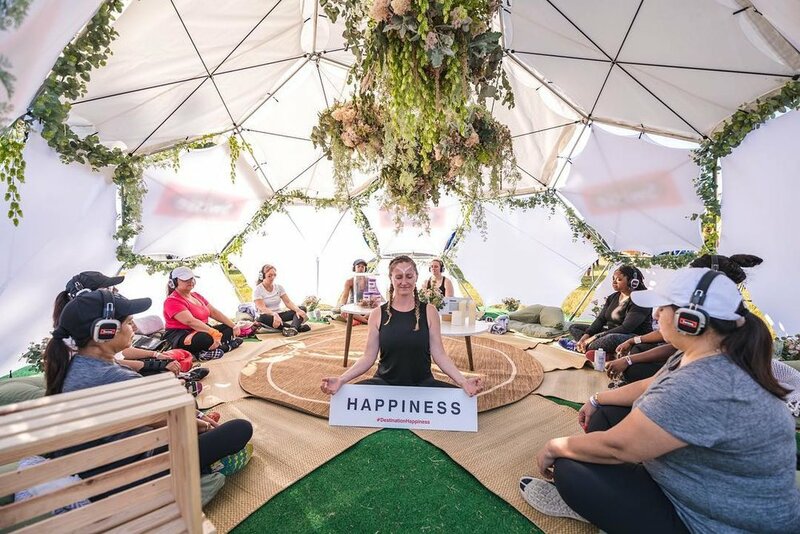 The Swisse experience is aptly named Destination Happiness, inspired by the company's mission of making millions of people healthier and happier. The Dream Dome was a soothing, shaded herbal mediation dome (inspired by ingredients in Swisse's Sleep product) where guests were invited to take a five-minute guided meditation. Swisse is still on tour and currently has been present at six U.S. based Wanderlust 108 events this fall, including Brooklyn, Philadelphia, Washington, Detroit, Tampa and Austin. We’ve already begun discussions for a bigger and better presence of domes next year! This summer has seen our domes crossing the Pacific Ocean in our new partnership with Arch Hawaii, a new branch of our rental and sales. They just completed the Healing Arts Festival in Honolulu with a beautiful presence of Archimedes Domes. Our domes surrounded by palm trees seems to be the perfect fit! Several new things happened with our dome design this year which will help us push our domes to bigger and better heights in the year to come. With new markets comes new branding potential, and we’re excited to see companies began to use the many facets of the dome for their own marketing potential. 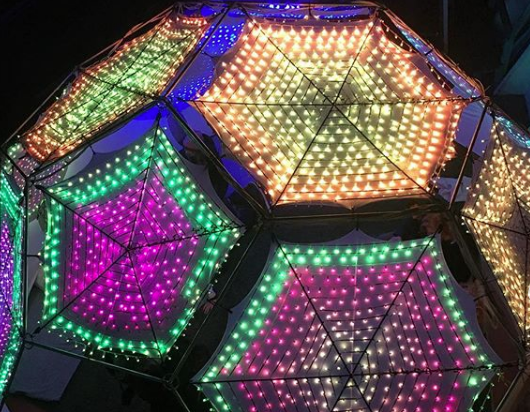 This year saw our first fully printed custom dome, in partnership with artist Jodi Sharp. The dome had every panel printed with a continuous art piece, showing what a beautiful environment can be created with custom printing. This dome was shown at seven festivals around North America this last season. Love our look but don’t need the full dome package? Now we’re offering custom spandex jobs, designed specially for your any event need. This particular ceiling was done for Kostume Kult, a New York based a costume art, theme event and street-theater club. Once again we went bigger and better, with the largest tented dome we have ever built. Spanning 26” in diameter and 20’ high, the dome had a full inner tent and was set up for workshops by Camp Mystic at Burning Man this year. Bigger and better is always our goal, and this dome was another step up. With our new poles, redesigned harnesses and new hubs, we will continue to scale up every season. This last season saw the newest edition of our full rain fly. With the capacity to remove or install individual sections, it’s a design that’s as versatile as the rest of our beautiful system. Soon To Come- New Cast Hubs! Still designed to be as strong as possible, the new hubs will be a sleeker design made out of aluminum, meaning they’ll be lighter and more cost effective than ever before! This season saw continued growth of incredible arts teams designing and using their Archimedes Domes. Here are some of our favourites! In partnership with Android Jones we now have three custom panels and a full art ceiling available for purchase. We already love the look of our domes, but now we get to offer even more options in print from this incredible artist. Tom Clark and team were the winners of our Incubator Contest at Gratitude Migration in 2017, and 2018 finds him continuing to work with installing led panels on his AD dome. His LED light show keeps getting bigger and better, and we’re excited to see him exhibit it at various events this winter! The only thing more fun than an Archimedes Dome is an Archimedes Dome on fire! MJM Special Event company of Montreal is in the process of designing a kit that you can add to your AD dome that will turn your entire dome into it’s own flame effect. These new fire domes are in process and should be available to rent and own in the coming year. One of our favourite teams to watch are the Spaship Troopers, a team that’s been bringing their spa services around the festival circuit this past season. 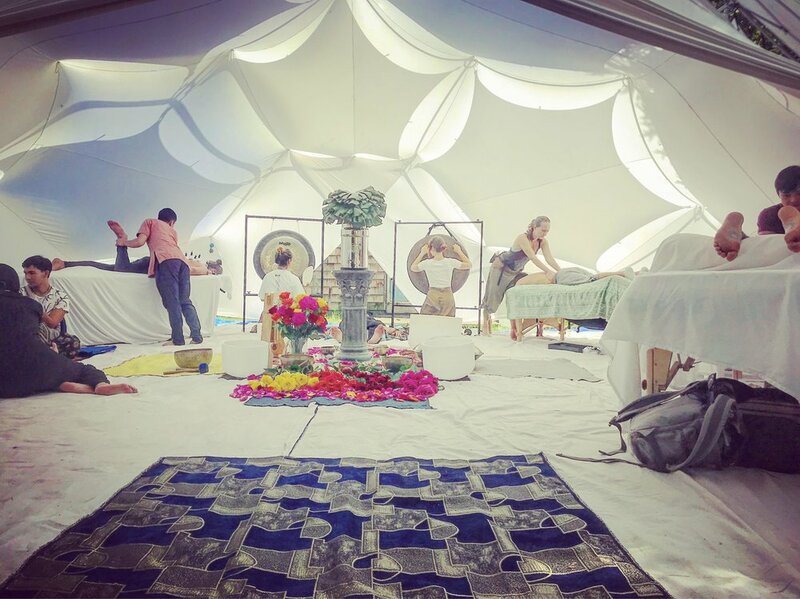 Offering massages, sound baths and meditation space, the team always sets up beautifully and has high quality services wherever they install. 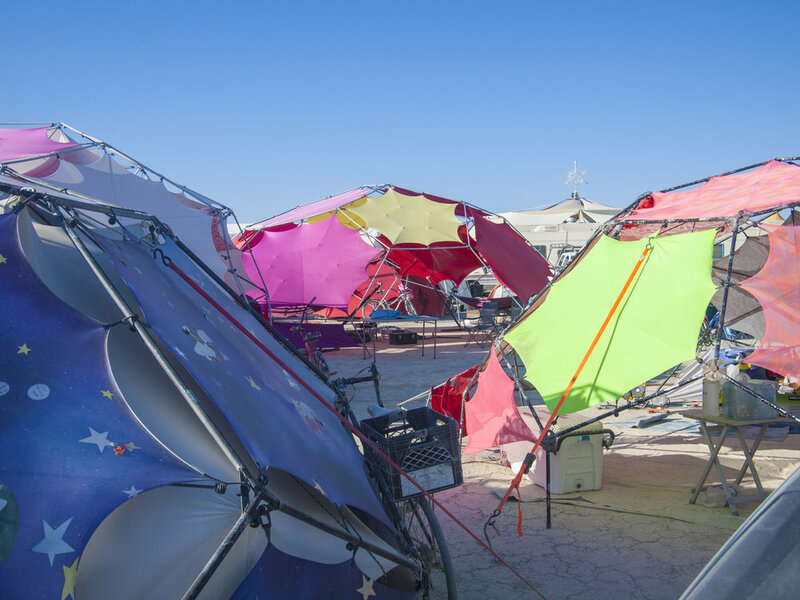 It was our 10th year at Burning Man this year! We must always remember to honour our roots, and it was so inspiring to celebrate our anniversary in the place where these domes were birthed. Ten years ago we never could’ve imagined what would come from our first journeys to the playa. It’s always amazing to look back and see how far we’ve come. Thank you so much to each and every human who made this year so incredibly great for us! It was another season to remember. We cannot wait to see what our next six months will bring!